Champagne is one of the founding traditions of New Year’s Eve, but do you ever feel like it gets a little… repetitive? We do. 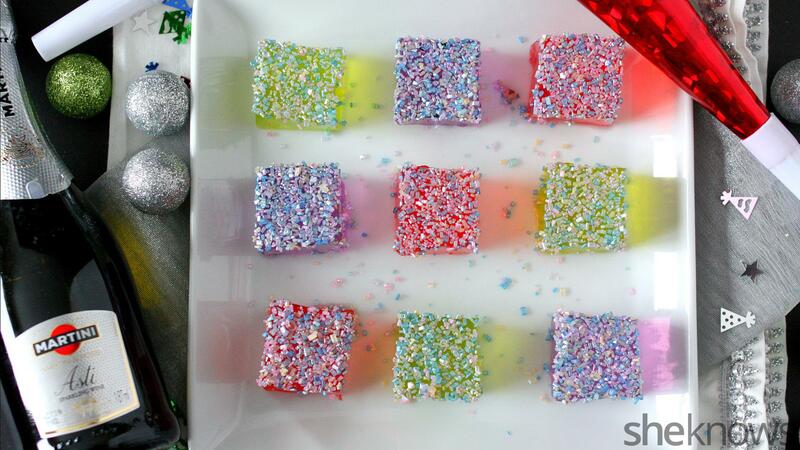 That’s why we put our own twist on Champagne: wiggly, sparkly, boozy Jell-O shots. These aren’t anymore complicated than you’d expect a Jell-O shot to be; it’s just that sanding sugar makes them look super-festive and Champagne makes them tasty (and relevant.) They seem a little classier than the vodka shots of your youth, right? It’s best to use large-crystal sanding sugar so it will not dissolve easily. You can find sanding sugar in most craft or baking supply stores. In a small saucepan, add Champagne and 2 ounces of the lemon-lime soda. Sprinkle gelatin on top and let sit for at least 2 minutes. Put the saucepan on medium-low heat and heat until the gelatin is dissolved. Do not let the mixture boil; you’re just letting the gelatin dissolve. Remove from heat and add in the remaining lemon-lime soda. If you want to add color, simply add a few drops of food color and stir. Add the Jell-O to small single-serving containers or a small baking dish. You can also add your Jell-O to a silicone ice tray if you own one. That is what we used. Put the Jell-O in the refrigerator for at least 2 hours until completely set up. Cut the Jell-O into squares and carefully remove it from the container. Dip the top in sanding sugar if desired. Keep the shots refrigerated until you’re ready to eat.